WASHINGTON, DC, February 17, 2013 (ENS) – Tens of thousands of people from across the country rallied in the nation’s capital on this chilly day to demand that President Barack Obama block TransCanada’s Keystone XL tar sands pipeline and move forward on climate action. President Barack Obama was not in Washington today. He was in Palm City, Florida, playing golf with the game’s most famous player, Tiger Woods, at the exclusive Floridian Golf and Yacht Club. The media was not permitted into the golf compound. On Monday, the President will return to the White House. Last Tuesday, McKibben was arrested in front of the White House with about 50 others protesting the pipeline and demanding that the President act to limit greenhouse gases the trap the Sun’s heat close to the planet, raising the planetary temperature. 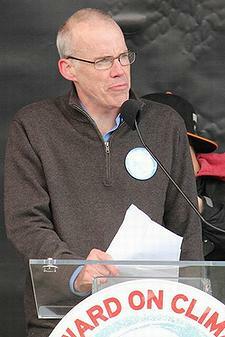 McKibben is the founder of the climate action organization 350.org, which takes its name from the advice of scientists who say that 350 parts per million of carbon dioxide, CO2, in the atmosphere is the safe limit for humanity. The current CO2 level is just above 390 ppm. The demonstrators are trying to call public attention to the fact that the Keystone XL tar sands project, which needs a Presidential Permit to cross the U.S.-Canada border, “would pipe some of the dirtiest oil on the planet through the breadbasket of America” to be shipped overseas through the Gulf of Mexico. “It would be a disaster for our climate, producing tar sands crude that kicks out two or three times as much carbon pollution as producing conventional crude oil,” McKibben says. 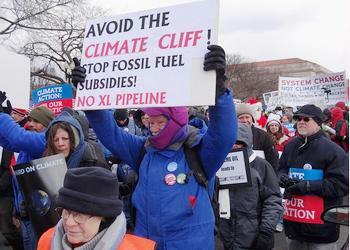 The demonstrators say the tar sands diluted bitumen that Keystone XL pipeline would carry would contribute much more than the same amount of ordinary crude oil to raising the planetary temperature. “Twenty years from now on President’s Day, people will want to know what the president did in the face of rising sea levels, record droughts and furious storms brought on by climate disruption,” said Michael Brune, executive director of the Sierra Club. 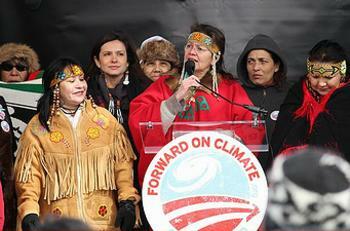 Native Canadians came to Washington to participate in the rally. “The Yinka Dene Alliance of British Columbia is seeing the harm from climate change to our peoples and our waters,” said Chief Jacqueline Thomas, immediate past Chief of the Saik’uz First Nation in British Columbia and co-founder Yinka Dene [People of the Earth] Alliance. “We see the threat of taking tar sands out of the Earth and bringing it through our territories and over our rivers. The harm being done to people in the tar sands region can no longer be Canada’s dirty secret,” Chief Thomas said. At least three coordinated anti-pipeline demonstrations were held in California today. In Los Angeles, events at City Hall, including a Prayer for the Earth, songs, dance and speakers, were sponsored by: Sierra Club Beyond Coal Campaign, Tar Sands Action Southern California, Food and Water Watch, and other organizations. In Monterey at Window on the Bay Park, people rallied and picnicked on the grass at an event sponsored by the Unitarian Universalist Church Social Justice – Faith in Action/Legislative Ministry, Progressive Democrats of America Monterey County, and the Sierra Club Ventana Chapter. In San Diego at Mission Bay Park Visitors Center a rally was held featuring speakers, giant banners and a singing telegram for President Obama sponsored by: SanDiego350.org, Citizens Climate Lobby, Sierra Club San Diego, and other organizations. This was also the launch of a Pacific-wide Warrior Day of Action, with the message “We are not drowning. We are fighting.” On March 2, Pacific Islanders across 15 Pacific Island nations and territories will be mobilizing at prominent locations to perform their unique war challenges, songs, and dances. 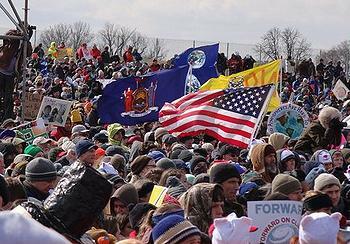 In Congress more emphasis is being placed to tackling climate change. House Democrats have introduced a “Safe Climate Caucus” and say they intend to have members speak about climate change on the House floor every day that the legislative body is in session. Senators Barbara Boxer, a California Democrat, and Bernie Sanders, a Vermont Independent, brought out legislation Thursday that would impose carbon emissions fees on producers and importers of coal and petroleum. Boxer said she wants the bill to come to the Senate floor by summer, but she has not yet discussed it with Majority Leader Harry Reid. Whatever happens in the Senate, the legislation stands little chance of passing the Republican-controlled House of Representatives.